Located north of Springfield, 1,202 foot tall Mt. Tom has been a recreational getaway for centuries. For many years, Mt. Tom in Holyoke Massachusetts was best known for everything but skiing. Starting around the 1890s, the Holyoke Street Railway Company developed what would become Mountain Park. Around the turn of the century, an elaborate summit building was constructed, serviced by a cable car. The amusement park at the base was expanded throughout the beginning of the century. Overall, Mt. Tom became a well-known destination, attracting prominent people such as President William McKinley and future President Calvin Coolidge. Daniel O'Connell of O'Connell and Sons Construction Co., owner of quarry land on the east face of Mt. Tom, became interested in building a facility to keep local kids busy in the winter. In September of 1960, O'Connell began development of a small ski area with the vision of building something much larger. Advisors to the development included Roland Palmedo of Mad River Glen, Walter F. Stugger of Carinthia, and Stan Brown of Berkshire Snow Basin. On December 17, 1960, Mt. Tom ski area opened as a surface lift operation with snowmaking. A 1,400 foot T-Bar served the Big Tom slope, while a 400 foot rope tow operated on the Little Tom slope. Beyond those slopes, the Big Tom trail was advertised as being open via snowcat service, giving skiers some additional 300 vertical feet above the 285 feet provided by the T-Bar. Ed Wakelin was listed as manager of the ski area while Robert Savard ran the ski school for the inaugural season. Mt. Tom's debut was enough of a success to justify immediate investment following the season. Mt. 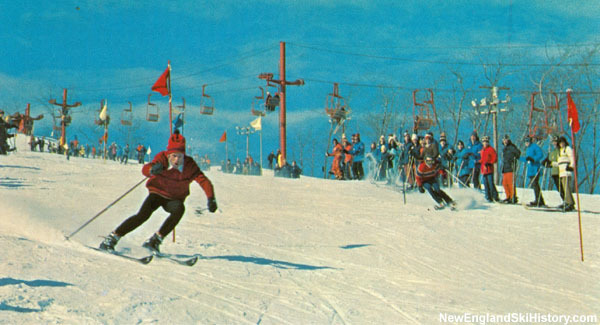 Tom became a major player in Southern New England in 1961-62 when a new 3,450 foot double chairlift was installed. Jules Eberhard took over the ski school for the sophomore season, while Cal Conniff took over as manager. To help satisfy growing beginner demand, a new slope and 600 foot rope tow were added for 1962-63. This slope would later become part of Boulevard. For the following season, an upper mountain T-Bar as installed on the Upper Tom slope to take some stress off the popular chairlift. Mt. Tom made headlines in 1964 when S. A. Fenton & Son Co. installed 280 feet of plastic matting, allowing for year round skiing. While other areas were left struggling following the winter of 1964-65, Mt. Tom was operating at full steam. During that off season, noted architect Alexander McIlvaine designed a sizable expansion to the base lodge. In addition, a beginner slope and J-Bar were added. General improvements included enhanced trail lighting and new chairs on the summit double chair. The double chairlift would be completely rebuilt for the following season. 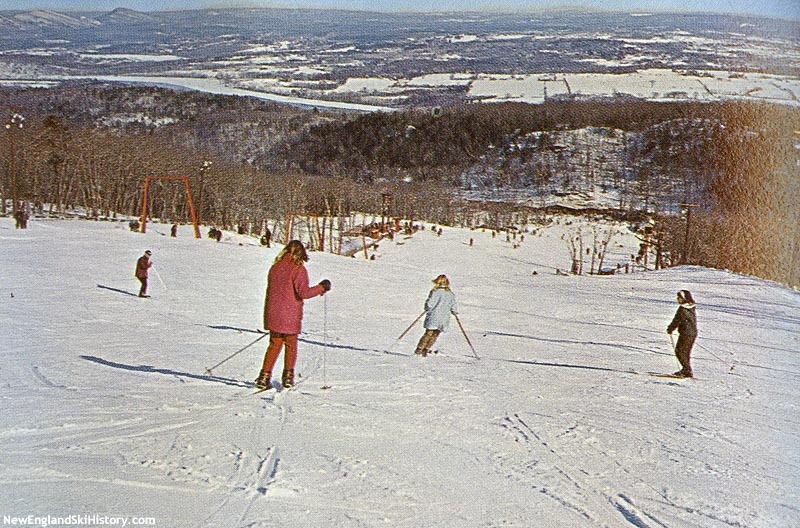 For 1967-68, the Boulevard slope and double chairlift were added. Part of a $250,000 off season investment, the new slope featured night skiing and a powerful snowmaking system. New "high intensity lighting" was installed for the 1969-70 season, facilitating night skiing off every lift at the ski area. With two chairlifts, a widely popular ski school, and a large night skiing business, Mt. Tom had become a powerhouse in Southern New England. Notable figures such as John Glenn, Governor Francis Sargent, John F. Kennedy Jr., and Senator Ted Kennedy skied at Mt. Tom during its heyday. A second summit chairlift was added for 1978-79 to help handle massive crowds. At Mt. Tom's peak, it recorded 300,000 skier visits, making it one of the most popular ski areas in all of New England. Skiing was not the only activity offered at Mt. Tom. In 1977 an alpine slide was added, followed by a water park about half a decade later. Daniel J. O'Connell Sr. died of cancer during the summer of 1983, leaving O'Connell and Sons and Mt. Tom under the watch of his son, James Joseph O'Connell. Nearby Mountain Park closed in 1987 and was subsequently liquidated, making Mt. Tom's summer attractions the only ones in town. As the 1990s arrived, night skiing still represented 40% of Mt. Tom's revenue. General Manager Dave Moore reflected to Skiing magazine, "we were the first to offer [night skiing] seriously, not just as a gimmick," adding that "it's a lot like softball leagues in summer or maybe a bowling league, except people are skiing." 1995 saw the installation of a fourth double chairlift, serving novice terrain. That fall, James Joseph O'Connell passed away, leaving ski operations to his widow Mary Rose O'Connell. Most likely around this time, Joseph O'Donnell acquired a stake in the ownership of the area. Meanwhile, Holyoke Mayor William A. Hamilton was pushing to have a casino constructed at Mountain Park. Hamilton was able to enter into discussions with potential operators such as the Trump Organization, projecting 10,000 daily visitors, 9,000 new jobs and $20 million in city tax revenue. Mt. Tom saw the casino as a potential boost to the ski area, as Dave Moore commented, "would more people help Mount Tom? I think so." Though the casino question passed as a local referendum, Hamilton lost reelection and the proposal ultimately did not pan out. Following the 1997-98 ski season, the ownership decided to close Mt. Tom ski area and focus on operating their adjacent quarry. By the end of the decade, the chairlifts, snowmaking equipment, and night skiing lights had been removed and sold. Soon thereafter, the plots of land comprising the ski area were sold to different owners, effectively putting an end to any chances of revival. "Grew up skiing at Mt Tom over 50 years ago. It’s a very nostalgic Hill to skin up in the winter. It’s a blast to ski down the same trail from the days I had a pair of Olin Mark VI skis, or my K2 710 comps. " "This place is where I came of age back in the mid-late 80s. Ski Club trips from CT every Friday after junior high school were real fun. Riding chairlifts with girls...the dark bus ride home! Lol such a great way to spend your adolescence. Miss those days. Will have to hike up someday soon to reminisce..."
"In 1963 I was the first of the second group of Junior Patrollers. Bud Johnson turned me down when I first applied, but called me back and offered me a deal. If I could make it through the year as a junior he would consider having a Junior program the following year. The following year there were two other Jr. patrollers so I guess I made it. I continued to "work" at Mt. Tom for three more years until I went college in MN where I worked at MT. Frontenac in Red Wing, MN. During winter breaks I would often come to Mt. Tom and ask if I could put on the green jacket. Bud never turned me down. As a junior patroller I would stay at the patrol shack over night, fall asleep listening to the snow guns, wake up, make coffee for the seniors and make the first run on the mountain for the day. I remember the Paradize family, the Walkers and Vet Jamison. Great training ground for patrol. One winter break I worked paid patrol at Waterville and later at Loon. Neither were as educational as working for Bud and Paul. Great area, good friends and I miss them all. Ski on !!!" "Skied Mt. Tom everyday with my brother from 1976-86,and with many friends who at the time all skied on Olin Mark skies. Some of the best memories growing up are from Mt. Tom, Waterfall, Pumphouse, Tote Road and getting chased by the ski patrol for jumping. I still go skiing and it would not have happen without Mt. Tom. A truly great place and even though it has been closed since 1998, for the people who have skied it especially the ones from Holyoke......Mt Tom will live forever!!! " "Fond memories of Mt. Tom! Based on what I have read it proves that to be GREAT one needs not be the biggest. Wonderful video Dave. You made Mt. Tom a place that people loved. Your passion for Mt Tom is remembered by so many skiers. Mt. Tom will never be forgotten! Thank you for everything. " "Mt. TOM Ski Area, my first love. Happy belated Valentines Day!" "I skied there almost from the day they opened until the day they closed. Every season I would look for the lights to signal the beginning of another great season. Mt.Tom played a big part in shaping my life. I met my wife there and many great friends that still get together and ski today!" "This may be a bit long but my father, Horst had a hand in launching Mt. Tom. At the time my father worked for Worthington Compressor on Appleton St. in Holyoke in the QA department. He got a call from Daniel O’Connell himself complaining about how the new compressors were turning on and off too frequently. When he got there he saw that Worthington had way oversold the compressors needed to run his quarry. Horst went back to the office and raised holy hell that O’Connel had been taken advantage of and this must be corrected immediately. My father personally oversaw the installation of the proper equipment for the quarry. In the meantime, this off the boat German built a bond with the off the boat Irishman. As they walked the property, Horst mentioned he could probably build a ski area given the terrain-but was water available? Up the mountain they went and found a spring fed lake which you could see off of the little chair. The seed was sown. Horst collaborated with Daniel and was offered a place as an initial investor for about $4,000 in the form of a bond. At the time, that’s what an average house cost. My old man ponied up the money (along with several others) and the ski area was kicked off. Instead of taking interest payments on the bond he took debentures in the form of ski passes. My brothers and I were on boards almost from the point of walking. We had free passes for over 20 years and can’t tell you how fun it all was and how many friends we made. VERY sorry to see the demise of the best ski area in Southern New England. It was a gem in our backyard......"
"I ski patrolled there for many years, from 1979 till its close. 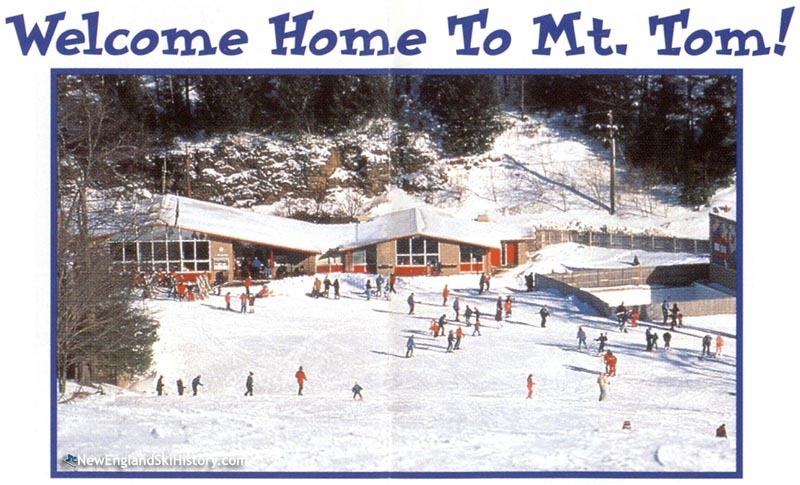 Still miss it dearly, raised my family skiing there as well. Still ski it every year to this day when conditions allow a skin up the old T-Bars! "Always white, day and night""
"Hi my name is Lou Judd i lived for the skiing at mt.tom sure miss it"
"Such fond memories from skiing with friends to being a part of Mt. Tom Ski Team. Nothing better than heading there after school and on the weekends! It will always be a part of my lifetime memories....."
"I remember 5-10 dollar car loads to my park we would load so many of is in a car and go have a blast I also think my grandad did some shrines cars there we also went on a field trip there my first and last time to ride a roller coaster and the fun of the alpine slide that was the best always though I would go over the edge and this was my first time to ski and my only time was not good at that at all so many great memories"
"My first time skiing was here in January of 1985 after my first semester of UMass. I had never skied and visited many more times in the next 3 years. It is sad to see it closed. Still skiing and miss the small local mountains! " "I have so many wonderful memories of Mt Tom, first day on skies at 4 years old up until my last days as a ski instructor. My kids learned to ski at this wonderful resort. The best memories were all are friends some 20 - 30 in a group all hanging out and skiing together . The great times Jeff Beaulac and me would fly around the mountain being chased by Niki Fox for jumping LOL!!!!! Sad it had to close but the great memories will last forever "
"The best years of my childhood life were had on this small mountain. My friends and I would get a seasons pass every year! We would ski from 10AM till 10PM. 'Always white day and night'! I would do anything to be able to ski this mountain again!" "I lived in South Hadley from 1965-1974. I can still remember my first visit to Mt. Tom with my dad who taught me to ski and I instantly fell in love with it. I use to cut lawns all summer in order to buy a seasons pass. My friends and I use to ski every Fri. night and all day on Sat. and Sun. 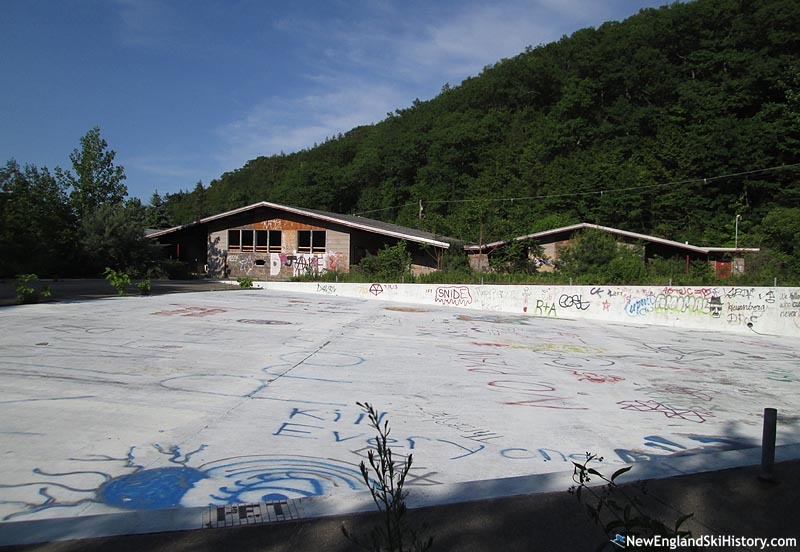 I have some great memories of skiing at Mt.Tom and sad to see the pictures of the abandoned buildings and all the graffiti." "I had spent my early years at Kiley & Classical in the 70's learning to ski at Mt. Tom Ski Area which was phenomenal for many a student. Low pricesClose to Springfield Consistently great ski conditionsMany of us were a part of various ski clubs which made it affordable in terms of time and money. It was a great place for friendships, family, and winter fun. Perhaps best of all was the spectacular views from Upper & Lower Tom of the Connecticut River Valley! Spectacular!" "I lived in South Hadley in the early to mid 80s. When I walked out of my house and looked right I could see the illuminated slopes of Mt.Tom. That view was great and was enhanced when the skiers holding candles took to the slope. Mt. Tom is also the place I skied my one and only time. I did well on the bunny slope and decided to go to the top where I remembered how much I hated heights. I made it down by skiing, falling down, skiing, falling down, etc"
"It's ski season again and I'm trying to get fit so I hiked some of the trails on Mt. Tom last week. Like so many other people I learned to ski there, worked there, and in some ways grew up there. Even had my first kiss on the summit chairlift. I traversed the mountain from the parking area near Bray Lake and came upon a sign for the old Tote Rd. As I made my way to the summit I have to admit that I was sad to see what has become of what had been such a happy place. Any remnants of the old ski area are now in shambles and covered with graffiti. I couldn't help but thinking that the sooner nature completely reclaims this place the better. Now I guess my memories and maybe some old pictures are the only thing worth revisiting at the old Mt. Tom." "All the comments above bring back incredible memories. I learned to ski there in 1972 taking a February vacation club class with instructor Sally Vollenger. From that moment forward, I was hooked and skiing became my passion and shaped the rest of my life. I never missed a night skiing after school until graduating from HCC. I worked as a repair tech and tuner in the ski shop which to me was the coolest job as I was a part of the sport I so loved. Dave Moore took me under his wing and made me the Ticket/Office Manager which gave me a crash course in ski area management. I also ran the summer grass skiing program. I have fond memories of escaping from Ski Patrol after getting big air off the Waterfall and the famous 'Jumping Strictly forbidden sign' on the Pump House. I later went on to work for Warren Miller and American Skiing Company and now live in Sun Valley. None of this would have been possible without Mt. Tom. Some of the names above are familiar to me and I skied with John Barrett and his brother who were some of the best freestylers. I remember the rivalry between two of the best ski racers ever to come out of New England who learned at Mt. Tom� Mickey Mcmahon who posts above and Tim Enright� I still hike the ski area when I return to Holyoke. Sad its gone but Long live the memories of Mt. Tom." "Mt. Tom was the centerpoint and highlight of my childhood, where my brothers and sisters and friends and I spent many a winter night barreling down the mountain and hanging out drinking hot chocolates in the lodge. Sometimes, I was so cold waiting for my mom -- or someone else's mom -- to pick us up that I literally cried right out there in the parking lot. And, in fact, it is where I broke my leg. I can't say that was a pleasant memory, but it still does not negate the wonderful times we all shared at the top (and bottom) of this mountain. I wish it was still there for today's generation, especially given how much snow Massachusetts has had lately. " "What a great pace to work and play! I grew up on Mt. Tom! Learned to ski there and spent many day and nights (open to closing) with friends making memories, not to mention making Dave Moore crazy! We went from young kids, to trouble making teens, to more mature young adults on that mountain! Season passed were how we spent the winter! I worked in the kitchen for a few year and had some great times while getting paid (and skied free).So sad that they closed and stand no chance of reopening. 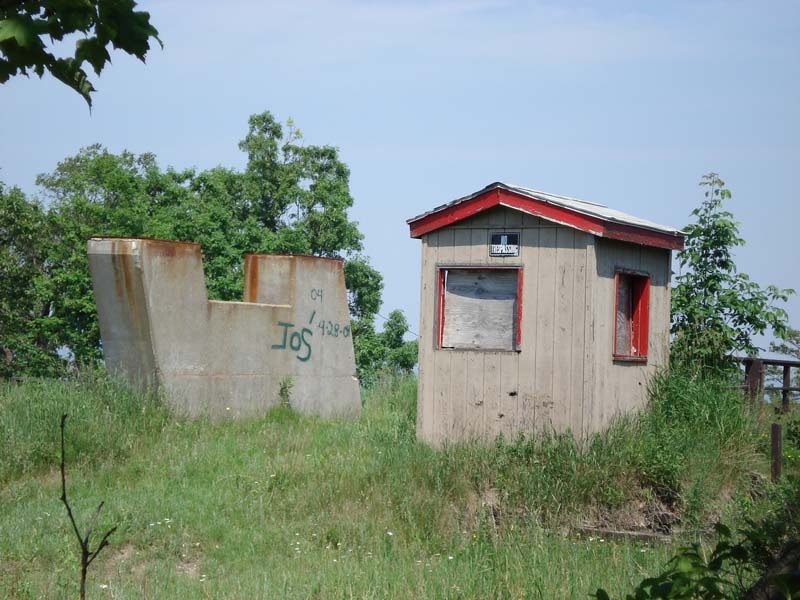 Holyoke lost a great recreational place when Mt. Tom closed! Thanks for sharing this memorable information!" "I learned how to ski there in 8th grade. I remember getting my season pass pulled because I got caught jumping too many times. Then I became a ski instructor there for a few years in high school and college. It's too bad it closed. It was so convenient to get to. I'd drive to school with my skis in the car, head up to Mt. Tom for a few hours and be home in time for dinner. " "My brothers and I literally grew up on this mountain. My step-father ski patrolled here for years. I may have been about 5 when he brought me up the J-bar, and sent me down the hill and started my life long love of skiing! I still tell stories about this place, some of my favorite memories of growing up, came from here. I miss it!" "My grandmother would buy us a season pass each year at Christmas. Best time of our lives. BTW: I've been told by 'reliable sources' that DOC ran the area as a PR hobby and never ran it as a sustainable business." "Hi - it's been a long time since I have been up in central Mass, but I was saddened to drive by recently with my teenage boys, literally telling then about Mt. Tom as I expected to show it to them personally as we approached along I-91. When we missed it, I thought it was just my mistake.How could such a visible, centrally located and accessible ski area (with Lights!) close at all? So close to so many good sized towns and colleges, I just don't get it.For me, it was the beginning of a meaningful life in the winter sports industry. As a Florida boy attending Wesleyan University in Middletown, CT, I had barely seen the snow...and I couldn't believe how lucky New Englanders were to drive so quickly to local ski resorts as a regular routine. So, like many others, I made Mt. Tom a regular activity as I taught myself to ski in the East...eventually learning to snowboard...which led me to grow up, save a famous snowboard company from an early demise (Sims), then start the World Snowboarding Championship in the year 2000 in Whistler.I used to joke to my partner and snowboard pioneer Tom Sims that it all started at a place called Mt. Tom. Unfortunately Tom passed away a few years ago, way too young, and we never were able to come back and ride Mt. Tom together. It's sad to see that nobody else will either...such a special place.Thank you for putting this site together. It's great to see so many accounts of so many memories.Best,John Textor"
"Great place. I used to work at Abdow's Big Boy on Boston Road in Springfield. A bunch of us would go skiing there on Monday nights. Lots of great memories. A shame to see it close, along with Mountain Park." "I and the pleasure of working at Mt. Tom for two seasons after teaching at Mt.Snow. What a great area and the staff is still one of the friendliest and most fun I have had the pleasure to work with. My last memory was dropping off a six foot sub sandwich for the lifties at the base of the mountain before I left the East Coast for Aspen. Thanks to Adi, Brian, Peter, Grace, Tony, and all the instructors and employees who provided so many great memories for generations of skiers and snowboarders." "Graduated in 1963 and had first job in Middletown CT. Mt Tom was a swinging place for college and recent grads. Many great memories." "For me, Mt Tom was a quick and easy escape from graduate work at Springfield College. Being able to ski/ride within 15 min. was a bonus. After meeting coach Glenn Olson, I joined the ski school, working for ski school director Adi Scheidle ('94-'95). We started the snowboard school that winter with Jeff Smith as director and I learned how to carve a snowboard. Brian Juchno, Seth Blackmer, Matty Brais and Jamie Morrell were all a part of that fledgling snowboard program, teaching hundreds or more how to snowboard. My children never had the chance to experience Mt Tom." "I worked at Mt Tom Year round for many years and learned to ski there. I loved it there"
"What a great place to ski and socialize with friends. My brother and I grew up there from the late 70s until the mid 80s. Ahh...the memories! Hitting 'Strictly' and the Pumphouse. Jumping the 'Fall'. Running down 'Tote Road' at night in the dark! Going 'Daniel Booning' (our version of Exteme Skiing) and ending up on the access road! Of course we actually skied on the trails too...lol. I even remember going grass skiing when they had that for a year or two. My folks still live there and I wish my kids (who both ski race) could ski there now...that would be cool." "as kids we had great memories, Daniel O'Connell had a great vision a place for kids to go ski. It's amazing how many people you run into skiing that said they have skied and have great memories of skiing Mt. Tom . We skied there as a family I miss that hill. Shame on the O'Connell family for letting it close, it would have made more money then mining and give families a great place to ski "
"My Tom was a great place to learn how to ski I'm sure the people of the Springfield area must miss it. " "Great memories! Skiing and many summer days on the water slides and alpine slide!"
"Great memories and babysitter for our parents. Like another said drop at first lift and pick up at closing. I would rush home to get me school work done so I could get some runs it. Just was at the Matterhorn in Sunday River. Looked over and saw a Mt. Tom NASTAR gate flag. Still racing today and my son started last year. That mountain built a bunch of great skiers." "Met my wife at Mt Tom at age 16 and then worked at the mountain for 12 years from that point on. Met a lot of good friends and as kids we got to run the place thanx to the tutelage of Dave Moore. Best experience ever. Wish it would open up so our kids could experience a great place as it was. " "Youngest of 4, we all learned how to ski there, and had a season pass every year until it closed. My parents would drop us off at the loading dock for first chair and pick us up at night after last chair. My sister worked there for many years...it was like a second home for all of us. We still hike it and ski or snowboard it. Makes me sad to see it in such a state now...so much history." "Some of the best times of my life were spent skiing at Mt Tom. I would get a season ticket night pass from my parents instead of any Christmas presents, and would spend almost every night skiing with my friend Janice. Most nights we would stay till closing(then get up for double sessions at Easthampton High). Saw Spider Sabich skiing at Mt Tom, won runner-up at the Mardi Gras Costume contest & was kissed by the Lt. Governor. Loved skiing the mountain...we would sing on the lifts & check out the cute boys in the lounge (we were teenagers! )..carried a bota bag & were known as the 'Brandy Twins' for a while...party on Upper-T side path....Seeing the light on top of Mt Tom, Then & Now, will always remind me of Skiing and fun times @ Mt.Tom"
"learned to ski at mt tom, great memories, you can get mt tom ski area shirts and stickers at the cottage 1615 northampton st holyoke, ma"
"This site brings back both wonderful and sad memories, as Mt. Tom was the beginning of my 40 year skiing career. As a student at nearby UMass, if you were able to carve out a morning or afternoon on your schedule, you could take skiing as one of the mandatory "gym" classes at that time in the early 70's. We had great fun, and then many years later, once married to another UMass alum, we took our children to the Alpine slide and had great times. Just this last summer we took some time and hiked the trails, taking in some nice views, but your really can't 'go back'. Too bad, as we have now settled for the warmth of South Florida versus skiing, we miss the cozy and friendly atmosphere that Mt. Tom provided. Michael and Nancy Shor"
"Too many to mention, many close to the heart. But I'm happy to say they span a time from when i was very young, skiing with my father, to intoducing my children to skiing, initially through the great afer school lesson programs they had. Remember the mid station on the original main chair lift, and my favorite lift, the upper tbar, with its long reach through the woods and lava rock. Those mats did a number on the ptex bottoms of skis. " "I started skiing at Mt Tom around 1971 when our school in CT offered it as part of their phys ed class. I skied there all through high school whenever I had the chance and could afford it, I loved it so much. When the Alpine Slide opened, I began bringing my son there and we had a blast together! We would race down the hill side by side (crazy!). We both look back at those times with much fondness. Great memories for both skiing and the alpine slide. :)"
"Wow, my friend said were going skiing, grab some boots that fit, and some skis that those boots will fit on, and let�s go. 30Min later there I was falling off the T-Bar, let to fend for myself, well with my other buddy who was a first timer too, by our exert friend. Parents dropping us off for the Twinight special, getting chased by the Ski Patrol, sometimes getting caught. Realizing even then, there�s not many things better than a well-timed run down the mountain. Like so many I started at Mt. Tom and owe it so much. It really is one of the best places I spent some time as a teenager, loved it. Hey does anyone know of any memorabilia available? " "What a great place that will forever be burned into my childhood memory. I first learned to ski at Mt Tom in 1989 after being 'talked into it' by a friend. Who by the way left me on the bunny slope to fend for myself. Nevertheless I have been skiing ever since and so do my children. I owe that to Mt Tom. I now live in Vt with all the big areas but would do anything to take my kids to Mt Tom and re live the best skiing memories anyone could ask for." "learned to ski there on wooden edge skis in 63. in high school learned to race and get big air being chased by ski patrol, smoky and deck were great risk takers and could really rip "
"A good friend and I learned how to ski in the winter of '68' which went on for quiet a few years, right through high school racing on the Holyoke High ski team. Had many nights skiing and riding up the chair through the dark areas trying to steal a kiss from a ski night 'date'. Was a good time in my life with good relaxing memories." "My father developed a small ski area in Maine in the early '60s and he would take us to other small ski areas, I presume to get ideas for running his. One summer we visited Mt. Tom and tried out the plastic snow. I loved it and always wondered what ever became of it." "SO much fun at Mt Tom.Thursday twilight ticket, Tom's tavern and great skiing. Right in my back yard growing up in Chicopee,Ma.The best that's ever happened to Holyoke,Ma! " "We certainly had some fun times as teenagers, at mt tom. One of my friends made a fake ski pass using a good camera, and a laminator. He got caught eventually, and the crap hit the fan. One of the chair lifts was so low to the ground, you could jump off before you reached the top. I am disappointed that it eventually closed as I would have liked to teach my son to ski there. " "Skied rode and worked at Mt Tom everyday in the winter all through my teenage years up until 1998 when it closed. And as I remember got yelled at a lot by Bubba with my friends. Mt Tom was my favorite place to be and is sadly missed!!!" "Fond memories of Mt. Tom in high school. Attended Wilbraham & Monson Academy and took skiing as a elective class. Great fun. " "I worked at mt tom for 12 years starting on the j - bar and closing the area as night lift supervisor. Mt TOM was a great place to work , we were one big happy family. The thing I miss most of all is all the skiers, it was almost the same people every night. If it was still open I would probably still be there. The last night I turned the lights off I did'nt think it would be forever. Yes, I really do miss the place! Mt. TOM forever !!!" "Wow do I miss Mt Tom. My brother and I both took lessons at the ski school while in grade school. I remember one of my teachers from Maple St was my instructor. Used to go with White Brook ski school. My friend Bart and I would always try and sneak a final ride up the hill to come down before closing. Cut it real close a couple times. Great memories. Very sad to see it go. I would reopen it in a heartbeat if I had the $$. " "What a great place. I would to go there as a kid with the school on bus trips once a week. I went from the 5th grade through the 12th grade. Great times bombing Upper T and Lower T to the bottom. I started my boys ski life at Tom in the early 90's. I miss seeing the lights from route 91 in Connecticut. Sad to see it gone." "I miss that mountain, what a lot of good people I met there and great memories that were created. I still see skiers up north from the Mt. Tom days and somehow the area still always comes up in conversation. " "Mt. Tom was the second place I ever skied (Cummington Ski Basin was the first). Mt. Tom was about a 15 minute drive so my mother could drop me off on Saturday morning, I'd ski till 12:30PM, get picked up and still be able to deliver my newspapers (Daily Hampshire Gazette). When I got older I discovered night skiing and spent a lot of time at Mt. Tom. Took some lessons, bought skis and boots at the ski shop (Garmont foam-injected boots). Great place to learn how to ski!" "Mt Tom was one of my favorite places to go in the summer. I loved alpine sliding in the early 90's it was a thrill. I broke my first bone there. So sad that its closed. I miss alpine sliding." "Made the first turns of my life on Mt Tom, what a life time ago ! late 60's. so sad to hear about the closure ! my ski life has not ended since, we moved to crested butte and i became extreme ! live in the cascades now and still ripping turns ! Thanks for the awesome memory's ! " "The lighted trails on Mt Tom were clearly visible from my childhood home on route 5 in Enfield, Connecticut. That's how I knew the area was open or at least making snow, usually a few days before Christmas. My parents didnt ski so I would hitch a ride with whoever was willing. I couldn't get enough and sometimes skied alone all day and night, splurging for a burger in the fancier reastaurant in the basement of the lodge. Was that called The Cellar? Those were great times that made me skier for life. My favorite trail was Waterfall. Long live Mt Tom." "What wonderful memories I have of Mt. Tom. We started going there as kids in the late 60's. My dad became an instructor and my sister and myself soon to follow. We were there evey weekend and one night during the week. One of of the most happiest time in my life and will cherish the memories forever! It's sad to drive by on 91 and look up and not see the snowguns blasting or the lights on the main slope....met alot of great people there. " "Started skiing Mt. Tom at age ten with the Sacred Heart Ski Club. In 1967 Friday night skiing with the club cost $2.75...What a deal. Taught my kids there, and enjoyed skiing with family and friends. I wish I had the opportunity to teach my grandchildren on the same mountain. Forty six years later still enjoying skiing.....Thanks Mt. Tom........ "
"I skied on Mt Tom in the 80's. Bit of a mellow hill, but the ski lift famously came within an inch of the snow, incredibly challenging to get off the lift. Also I left a good part of my right forearm on the alpine slide and the water slide had to have been the most painful in the nation, great times." "learned to ski there as a young adult, have many fond memories and it was a great place to learn, was so sorry when it closed." "So odd this places closed, it was always incredibly busy. It was a great place to learn to ski and super easy to get to. Remember being crushed by the removal of the Alpine Slide in the early '90s. I think I still have some scars on my knee from a particularly bad wipe out.Not sure why but for some reason they only took cash. People with credit cards would always be outraged that they couldn't use them to buy tickets." "I have been skiing for 37 years, and I fondly remember my first time on skiis at Mt. Tom. That day changed my life forever.....I became a life long ski bum after that trip...sad to see it closed...."
"Mt.Tom,Was a Great memory for me. every Sunday Night 5 to 10 of us went up for Night skiing. As soon as we saw the lights from South Hadley, we knew She was open! I have done it all up there,Snow Ski,Grass Ski, even the Alpine Slide. My Dad owned Baran's Shell Station on South Street Holyoke for years.."
"What a sad ending. I have vivid and fond memories of this ski area. The views to the north were quite impressive. A neighborhood friend and I took our first ski trip there from Framingham in 1967 as I remember. It was a real adventure for us. "